Background: Con A, a lectin extract from jackbean Canavalia ensiformis is known for its agglutination activity. ZnO nanoparticles promote the faster electron transfer between the lectin immobilized and the target cells. Hence, Con A immobilized on ZnO nanoparticles will agglutinate cells more effectively than the native protein. Objectives: Concanavalin A (Con A), a lectin was immobilized on the hexagonal zinc oxide (ZnO) nanoparticles to monitor its activity on RBCs and lymphocytes. Methods: The immobilization of Con A and zinc oxide nanoparticles has been studied by molecular docking, microscopic and genotoxicity assessment techniques. 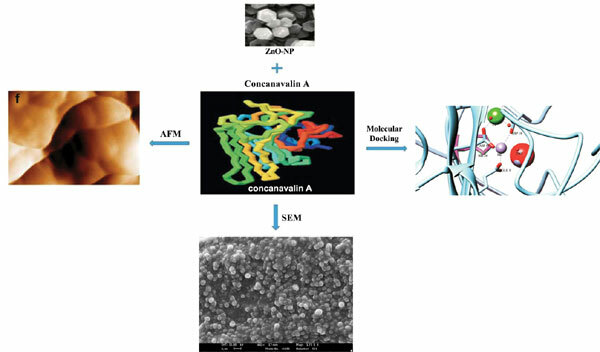 Results: Qualitative assessment using various techniques like atomic force microscopy, scanning electron microscopy and X-ray diffraction showed minor changes in morphology of Con A and ZnO nanoparticles. FT-IR spectroscopy confirmed the linking of Con A amino groups with ZnO nanoparticles. Con A immobilized nanoparticles in contrast to native lectin showed minor changes in hemagglutination activity as confirmed by pH dependence studies using fluorimetry. Con Aimmobilized nanoparticles retained the agglutination activity, this can be indicative of their potential application in detection of virus transformed and neoplastic cells. The Con A immobilized ZnO nanoparticles did not induce any significant but minor damage to whole cell DNA as revealed from comet assay or plasmid DNA. Conclusion: Con A immobilized on ZnO nanoparticles showed minor changes in the structure of ZnO nanoparticles and in the conformational of native Con A. However, Con A immobilized ZnO nanoparticles interestingly, showed pH resistance and better hemagglutination activity as well as minor DNA damage to whole cell lymphocytes. Thus, this novel bioaffinity support has prospective clinical implications. Keywords: Concanavalin A, fluorimetry, hexagonal, immobilized, nanoparticles, qualitative assessment. Keywords:Concanavalin A, fluorimetry, hexagonal, immobilized, nanoparticles, qualitative assessment. Abstract:Background: Con A, a lectin extract from jackbean Canavalia ensiformis is known for its agglutination activity. ZnO nanoparticles promote the faster electron transfer between the lectin immobilized and the target cells. Hence, Con A immobilized on ZnO nanoparticles will agglutinate cells more effectively than the native protein.